One of the things I plan on working on over the summer (along with Bronwen and Stephen) is our new website. Setting up our website has been a mission. We purchased a domain name from GoDaddy some time ago (frompsons.com) but decided we wanted something a little…well…cooler sounding. After much back and forth, we came up with Applekeep. Why? 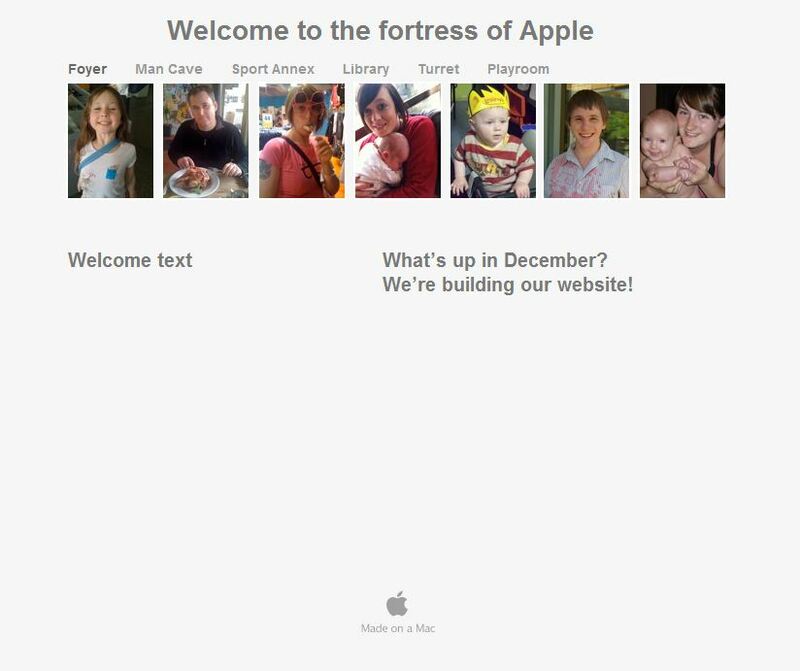 Our website is like an extension of our home, and our home is where we keep our Apples. Also, it’s easy to remember and to spell. Figuring out the hosting of our website was a significant hurdle. Initially, we decided we would just use Vodafone’s free (for customers) service. I don’t know if you’ve ever tried navigating their webspace…but after many attempts, we gave up.It seemed better to pay for a service that actually works. We’ve decided to go with Apple’s MobileMe service. Appropriate, right? It provides us with webhosting, email, cloud storage, cloud syncing, and a range of other things that are useful to us as iPhone/iPad owners. So soon our website will be up and running. It will document our lives – all our various interests and hobbies. And although it is out there in the public domain, it’s mostly just for us. Stephen and I are both interested in the process of building a webspace, and in teaching Bronwen how to do this. Pop in and see how it’s coming along if you like, but be aware that most of the site will be ‘under construction’ most of the time (for the next few months anyway). One part of the site that I intend to get going on first is the bit dedicated to our wedding. I’m hoping to provide a one-stop-shop for people to find out the details of the day, but also for other people planning a wedding to read about our experiences. I’ve been visiting the same bread shop for about a year now, every week. On Friday afternoon, Bronwen and I go to the mall for a beverage, a muffin and a catch up. I hear all about what’s going on in her life and we watch the world go by for an hour or so. Once we are finished with that, we go and see the ladies at Baker’s Delight. Usually we are served by Angela. She’s lovely. And sometimes, for whatever reason, we don’t make it to the bread shop on Friday afternoon and we get our bread on Saturday morning instead. Riveting stuff, huh? Well that’s not the story, so read on! I collect stamps until I get to the 5th stamp. 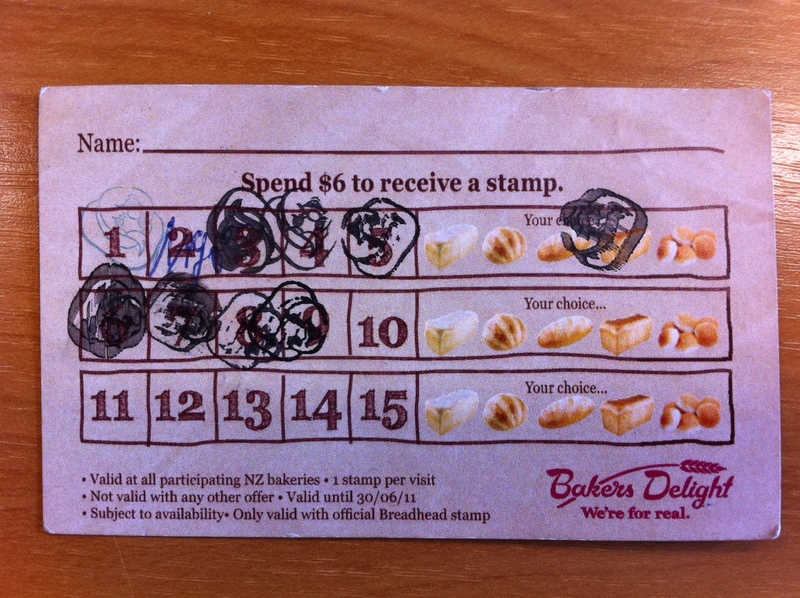 In order to get my free bread, I must collect the 5th AT THE SAME TIME as I redeem my freebie. In order to do this, I have to spend $6. So I always get two loaves for $6.50. That’s enough to get the 5th stamp and I can redeem my freebie … another loaf of bread. But I don’t want three loaves of bread. I want to be able to redeem my freebie NEXT time I’m visiting with Angela (or god-forbid, Sue). Sue kindly pointed out that I could just pay for ONE loaf of bread (at $4.90) and then get something else to ‘make up’ to $6 in order to get a loaf of freebie bread. But why would I do this? I only ever buy two loaves of bread – that’s all I ever want. I’ve never even look at the other offerings in the cabinet. I argued with Sue about the logic of requiring customers to take their freebie at the same time as their purchase (i.e., you can have a free coffee, but you have to buy a coffee first…what if you only want ONE coffee?!). My arguments fell on deaf ears. It is the way things have always been done, explained Sue. Sigh. This weekend, I decided to humour Sue. I dutifully selected my one loaf, and an additional scone because it was the cheapest non-bread item on the menu. I paid my money, got my stamp and received my free bread. I took my bread and scone, and off I went. Then we sat down and analysed the transaction (I know, but this is how things roll in our house, okay?). I paid $4.90 for my one loaf. I paid $2.20 for the scone. I got a free loaf (hurrah, free stuff!). I spent $6:30 in total. I received a useless scone that I didn’t want. In essence, my loyalty saved me a grand total of .20 cents. Am I the only one that thinks this is strange? Sue thinks it makes perfect sense. It made me so mad I wanted to rip up the card. And that’s pretty mad for me, especially when, as you can see, I’m SO close to another free loaf. So now what should I do? Should I continue with the stamps and collect inedible scones? Should I rip up the card? Should I, as Stephen suggested, refuse to go back there until my loyalty is rewarded in the manner to which I am accustomed? It is REALLY delicious bread. It forms the backbone of our weekends. I just don’t know.